Today is my third Thanksgiving here in Qatar. I have celebrated with people from India, Pakistan, Jordan, UK, Canada, and many other countries in our Thanksgiving feasts. Some of them have heard about Thanksgiving from movies, and they wanted to get a peek into our American holiday. I have not always had a turkey and the usual pumpkin pies with them, but a more varied mix of food, like curries and meat pies. Yet the familiarities can, with some effort, be somewhat duplicated here. But today I find myself stripped of many traditions, and thinking about my abundant blessings. 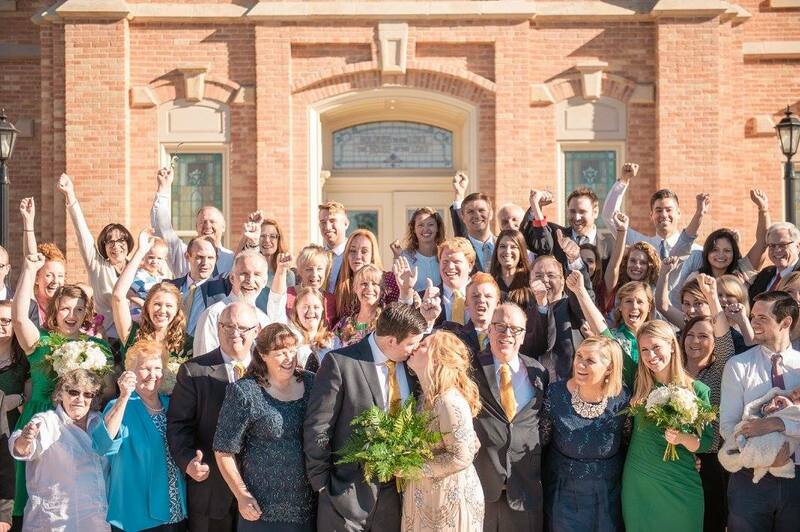 I am thankful for wonderful family and friends who inspire and support me every day--at my daughter's wedding in September. 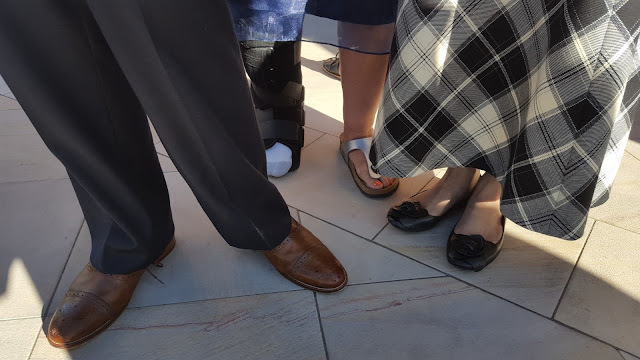 A few days ago my brother-in-law sent me a picture that said, "In case you have forgotten the summer of 2016, here is a picture to have a laugh." I am standing with one boot (feeling very lucky and blessed to be standing) at my daughter's wedding. I had already been sitting in a chair for almost two months after my ankle was broken. From my experience this year with my injury, I have decided to have a life of "Thanks Living." I want to be grateful every, every day for dear family, friends, my faith, health, nature, raindrops (they are very scarce here in the Middle East), music, art, good books, savory soups, and thousands of things. A few years ago, my good friend, Joy, began a tradition on Thanksgiving Eve. Friends and family gathered at The Old Stone Church in St. Louis, a familiar spot on The Underground Railroad where a few slaves are buried. On those Thanksgiving Eves, we gathered to express gratitude before the feasts with music and stories. There was no heating, not much light, and an old organ that you had to pump to hear the music. As we shivered and saw the cold breath spout from our mouths, we listened to others' blessings. Our hearts united; for a small moment in time, we remembered our blessings. It was the perfect preface for the next day of turkey and pumpkin pie. Now living far from Turkey Trots, Turkey Rolls (sliding a frozen turkey across a gym floor like a bowling ball) to knock some pins down, and more particularly family and old friends, we will continue our Gratitude Gatherings or Thanksgiving Eves. I can spend dozens of hours shopping and cooking a feast, and it can be gone in a few minutes. But the real bonds happen around the table, the UNO game, the nature walk--and those can be done anytime of year. So light a large candle, and let the melted wax drip--until it vanishes away. Talk about your blessings. Express your love. Make every moment count. Turn your Thanksgiving into "Thanks Living." A view from a park, looking into the Old Town of Prague. Towers and red roofs dot the landscape, an endless expanse of gargoyles, spires, and watchtowers. 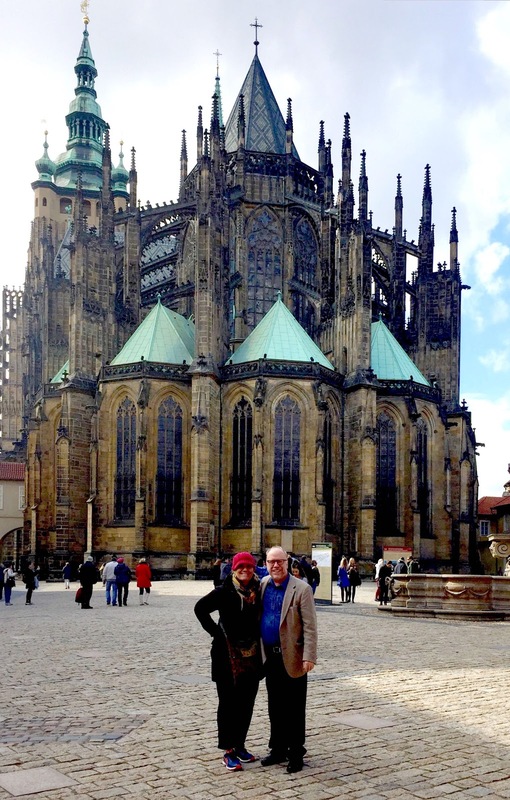 Praha, known as the "Golden City." 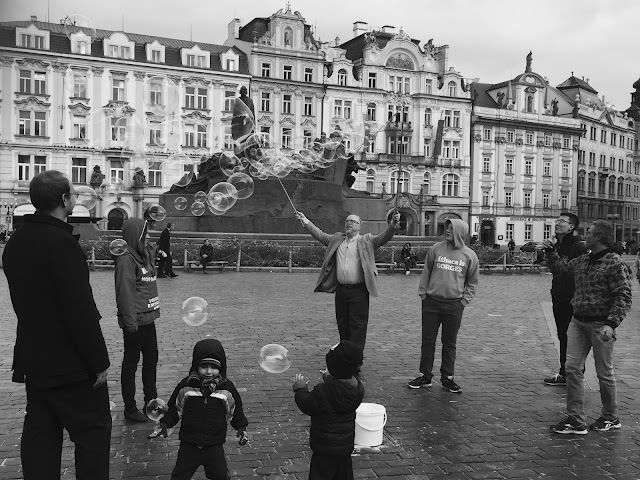 Joseph showing off his talent of making bubbles for some onlookers. He had plenty of practice for our kids' birthday parties. 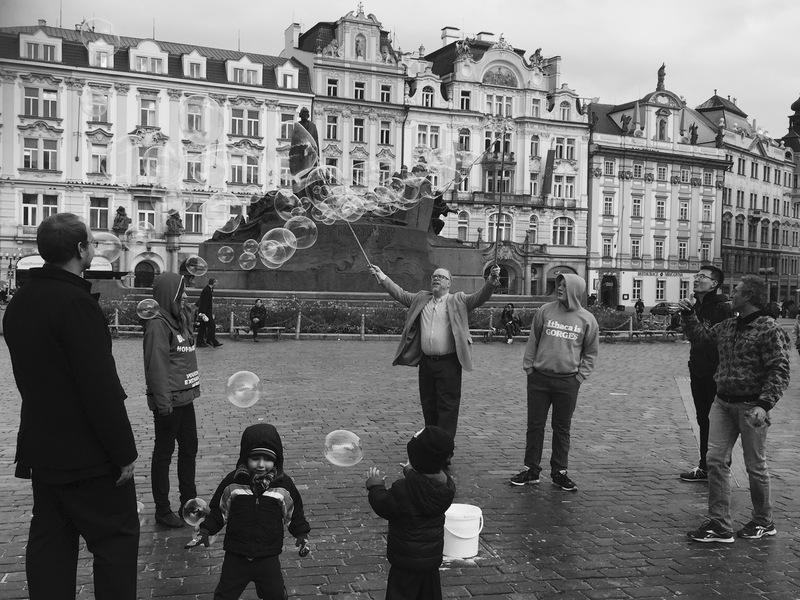 Many people came to the Central Square in Prague that morning to watch his talent. 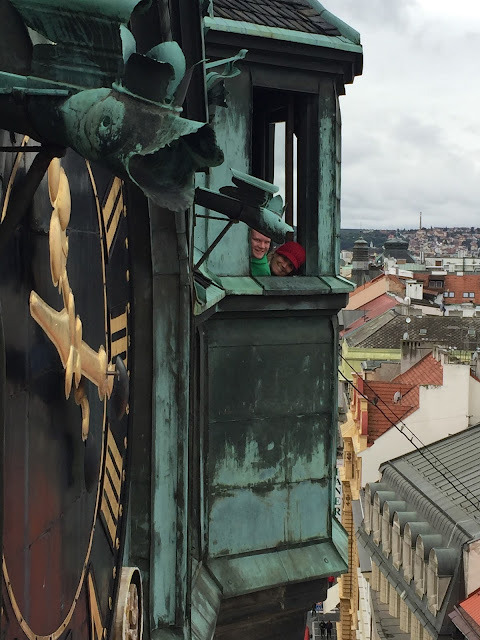 Here we are up in a clock tower, looking over all the spires and steeples. Prague Castle, an endlessly fascinating place, filled with museums, little towns within the city walls. 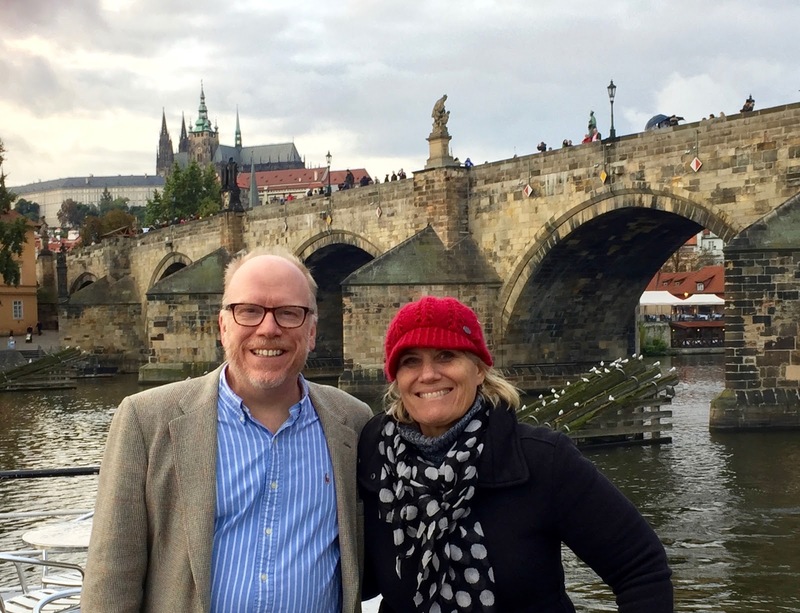 The Charles Bridge, the most famous bridge, among the main bridges ( some say up to three hundred). It is one of the most beautiful bridges I have ever seen with the Vitava River flowing by. People have been walking from one side of Prague to the other for over 500 years on it. I would even say it is worth going all the way to Prague to walk back and forth a few times. There are musicians, clowns, food stalls. The views are stunning--seeing the many bridges built up and down the river. Catholic saints are placed all along the sides, for people to remember them. 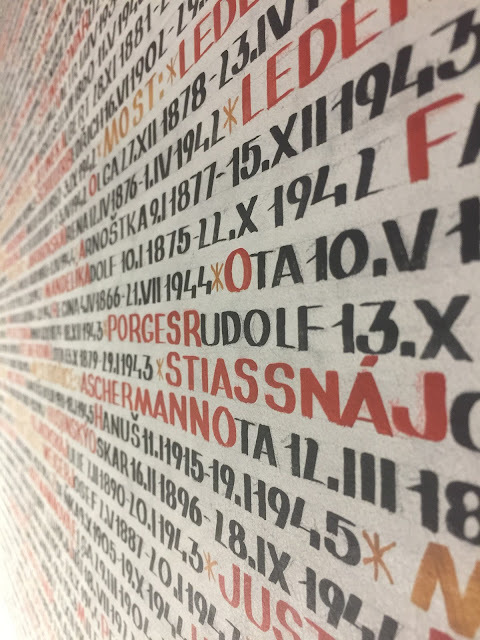 Almost 80,000 names are handwritten in the Pinkas Synagogue and Museum in the Jewish Quarters, all of them being from Morovian and Bohemia descent. It is a place of great soberness and reflection. 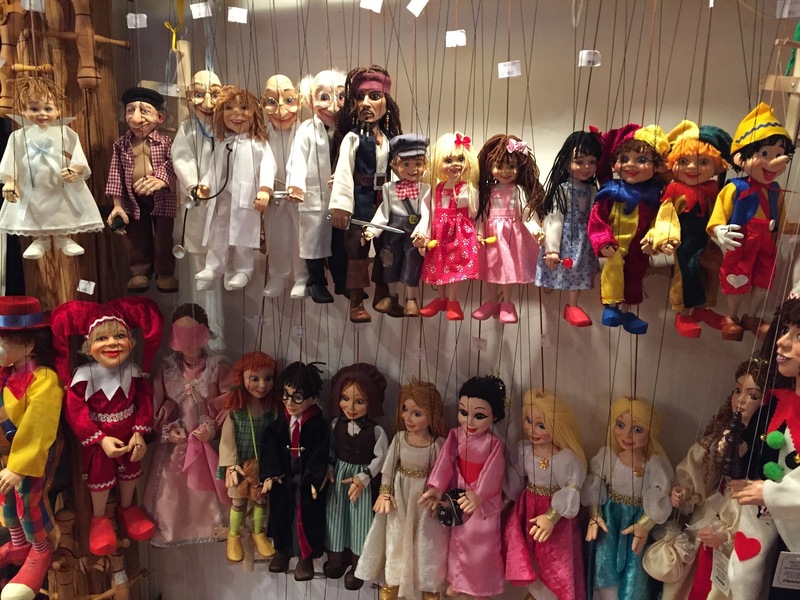 Marionettes are everywhere in the markets and stalls. 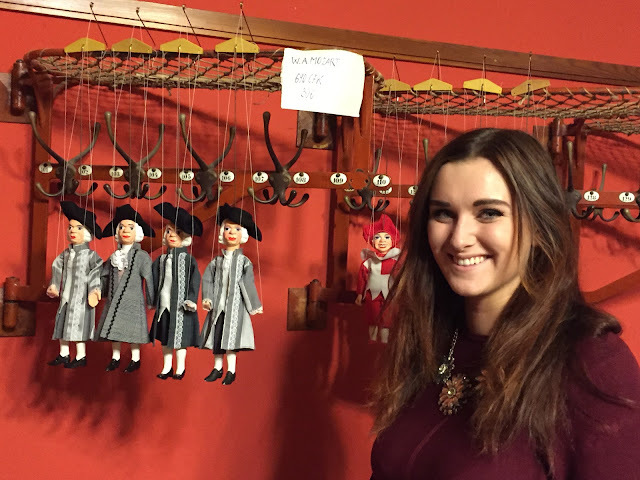 They were begun to be made in the 18th century here, and Czechs revere puppet making as a real art. 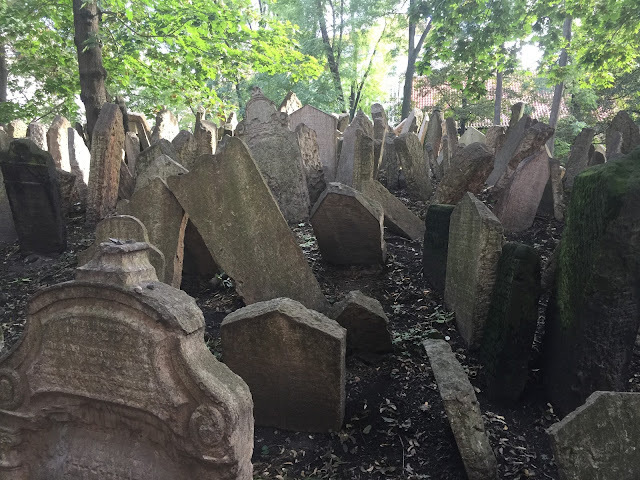 You can find witches, kings, princesses, Mozarts, Don Giovannis--to just name a few. 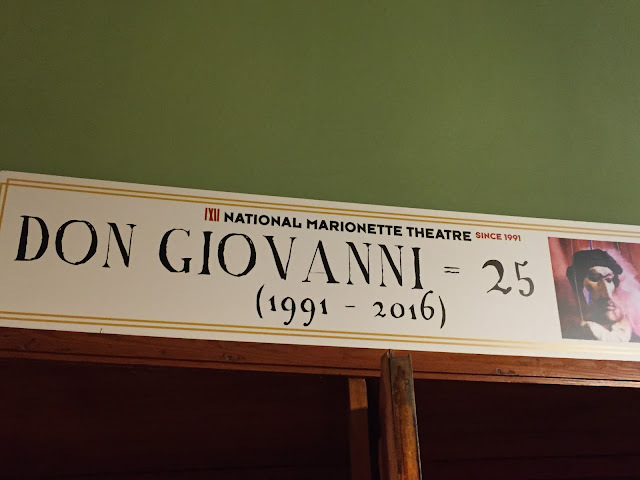 One wonderful memory was going to a marionette show of Don Giovanni at the National Marionette Theatre. Some Mozart marionettes in the distance. Mozart debuted Don Giovanni in Prague in 1787. Praguers are proud that they recognized the genius of Mozart before the rest of the world. 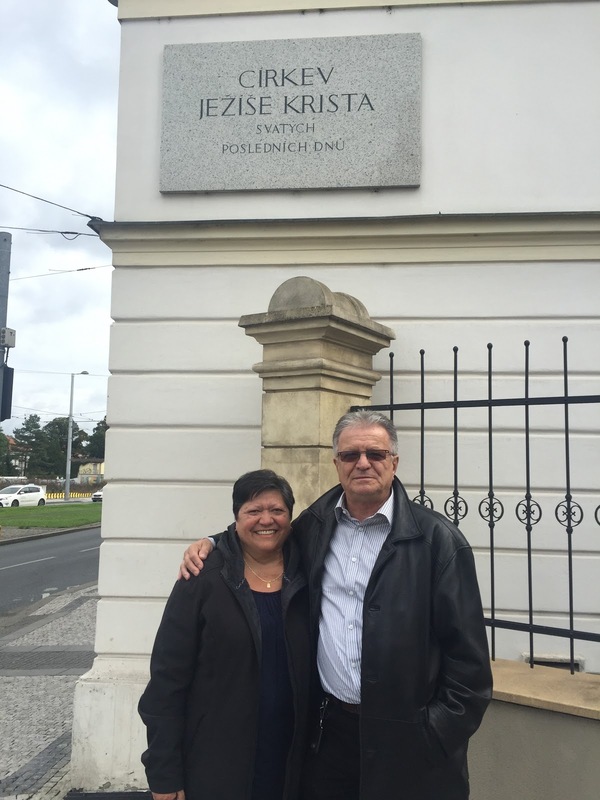 When others were skeptical of his music during his lifetime, Praguers only sang his praises. Don Giovanni and The Magic Flute marionette shows are favorites among the Czechs. Music and opera are integral parts of their lives--even among children. 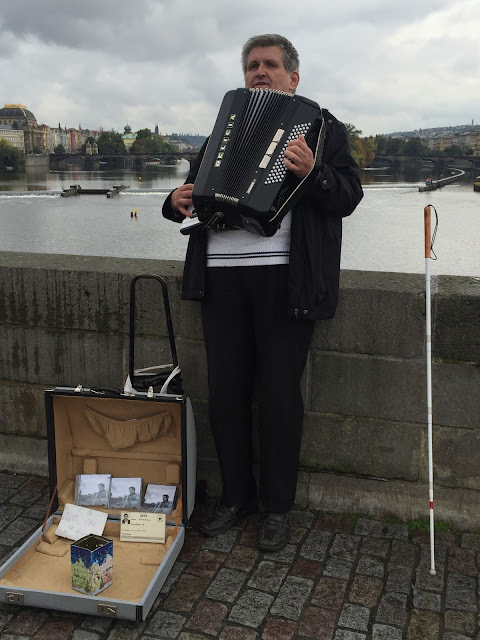 On the Charles Bridge, there were several musicians, and this one caught my eye since he was blind. My father-in-law was a blind musician. I sat and listened to his Czech folksongs for a long time, while the boats floated by. Waiting in the line was worth it to try a "trdelnik"--called a donut cone or a chimney cake. 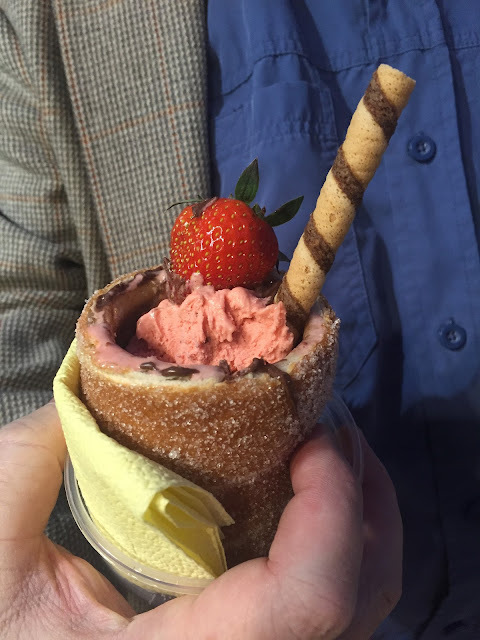 A Czech ice cream cone, with the pastry dough wrapped around the ice cream, with some nutella. A strike of genius. Music, music everywhere--on almost every corner. Most cathedrals had classical concerts nightly for tourists. We went to a Vivaldi and Beethoven concert. 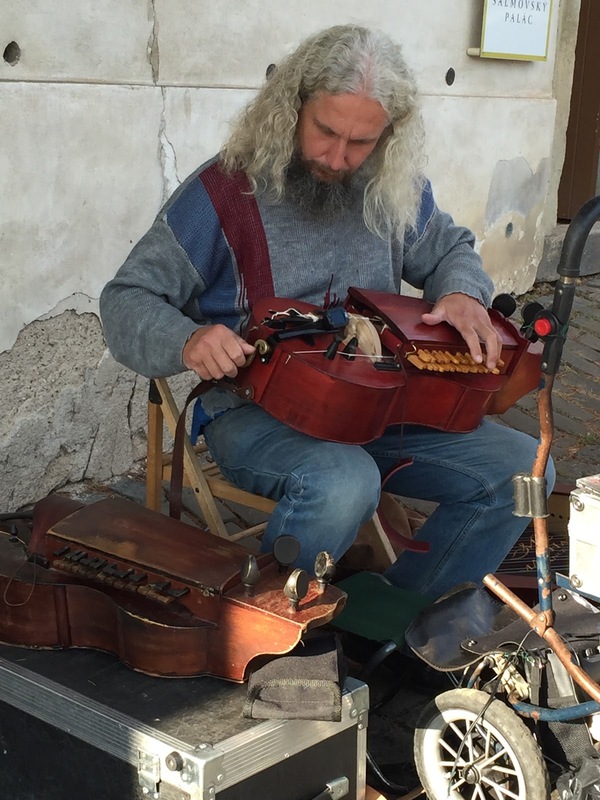 Czechs love their music--folk, opera, classical, modern. 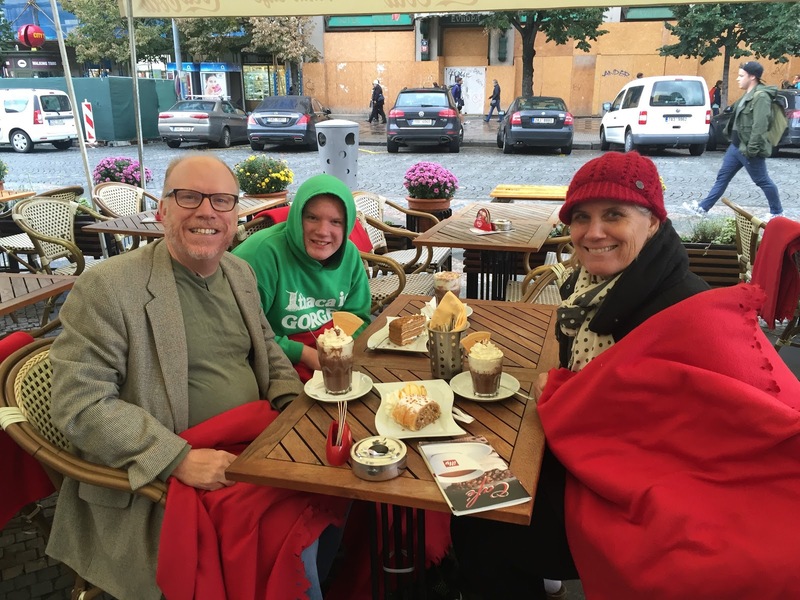 Wherever I go, my favorite food to try in any country is their soup. Perhaps it is because I believe soup is created with pure love and devotion. 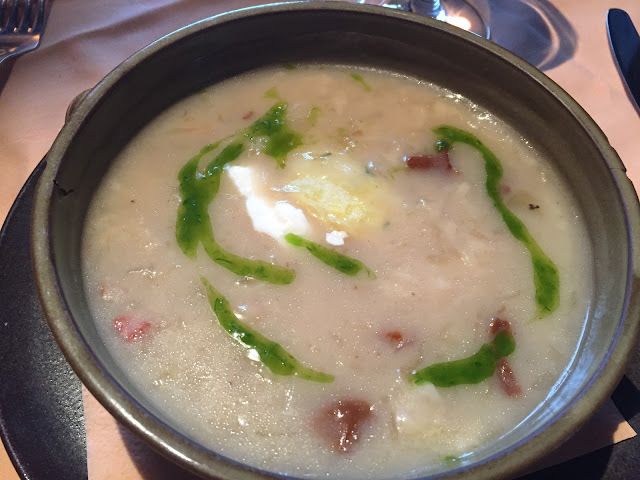 My husband talked about this bowl of sauerkraut soup for several days. I even made it when I got home, and I will continue to crave the tang of this soup. Sauerkraut Soup Recipe I promise you won't be disappointed if you make it. 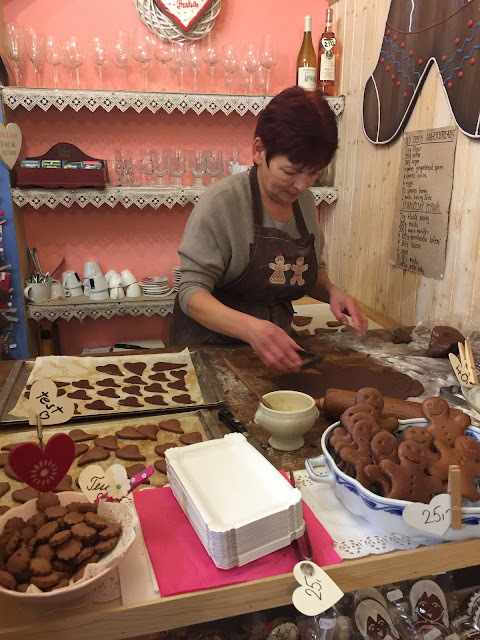 A bakery, with traditional gingerbread cookies. At every cafe and restaurant that was outside, a fleece blanket was provided on the chair to warm their cold patrons. Some friends we met who shared with us their stories of escape and rescues. 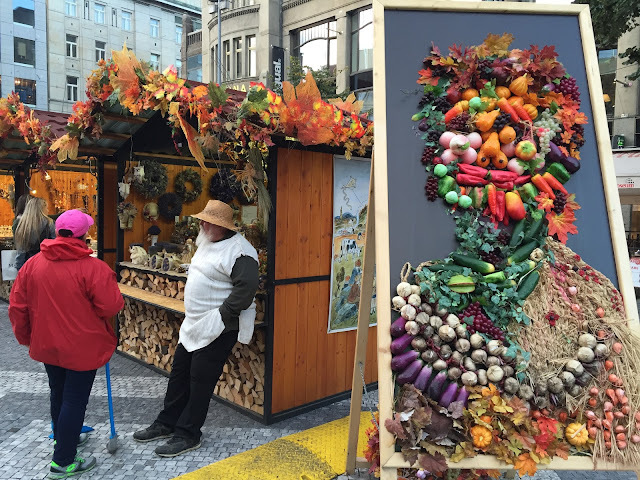 At one of the harvest markets. I loved the decorative pictures made with vegetables that were displayed around the market. Hey, My name is Elias. I like my art. 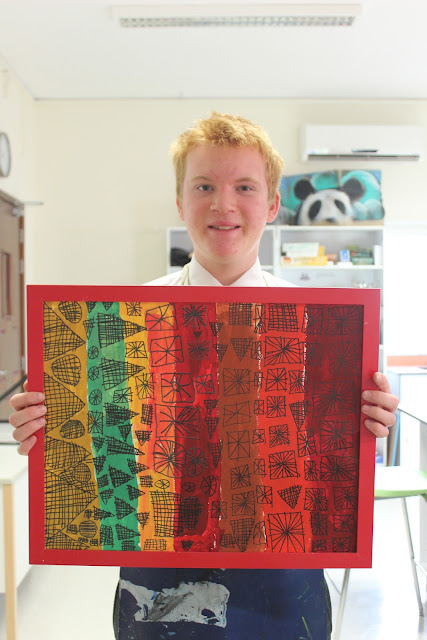 This is a new picture I did with my new art teacher. I did stripes and then drew designs on it. I like putting the shapes together. It reminds me of a rainbow and a blanket. I want to be an artist when I grow up. I like to remember that we all see the world in different ways,with different colors and designs in our eyes. It is always warm here in Doha, It looks like it is going to rain here. Christmas just came a little sooner for me this year--from my recent trip to the Netherlands. And I could not have been happier to begin to celebrate my favorite holiday. 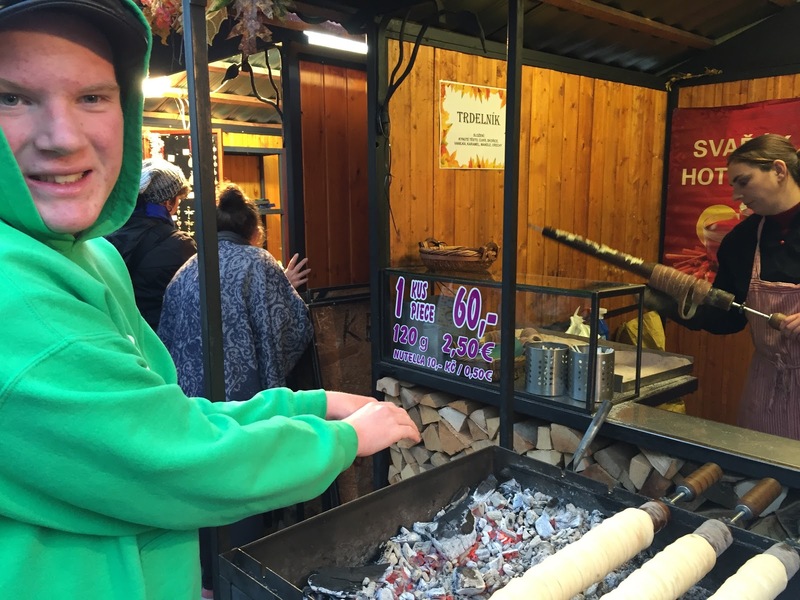 To learn the Dutch traditions and hear their memories of Christmas and Sinterklaas made me feel like a child again. It seemed everyone in the Netherlands turns the clock back (in my case, many years) in mid-November as Sinterklaas arrives on the boat from Spain. 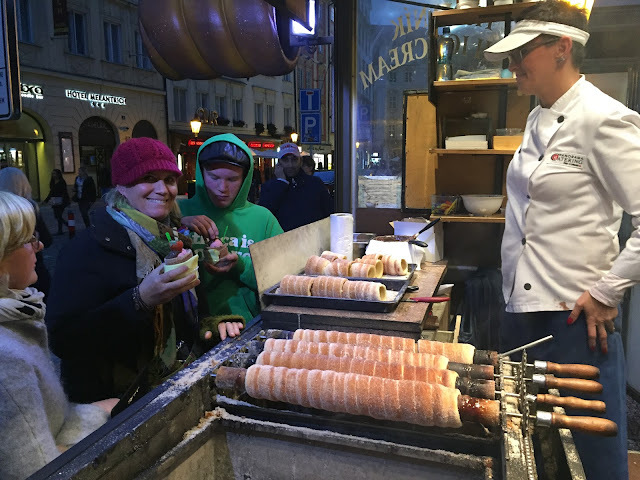 There are parades, canal rides, and thousands of children to see. Everyone is jolly, festive, and smiling. 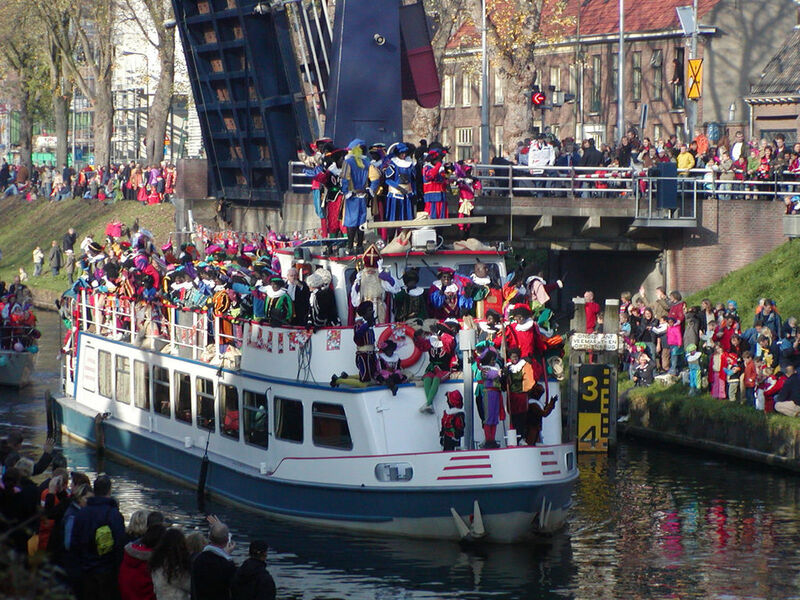 Sinterklaas arriving from Spain, on a canal of Amsterdam. 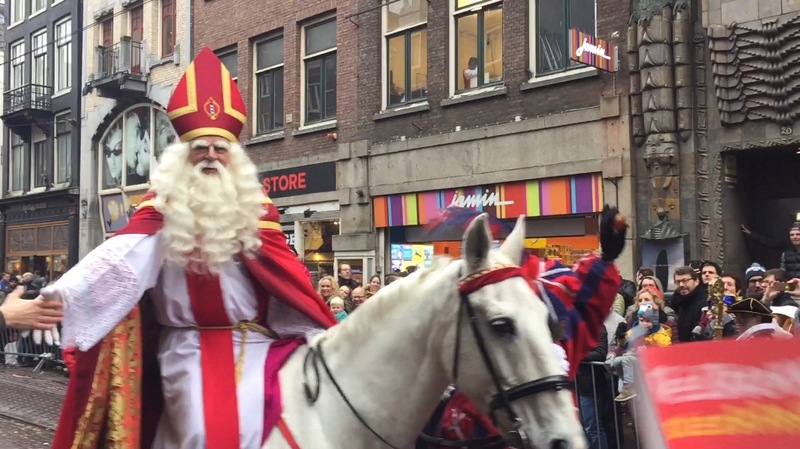 He comes every year in mid-November, staying in the Netherlands for about three weeks to visit the children in schools and communities. Children all over the Netherlands put out their shoes on the eve of St. Nicholas Day (December 5) to receive candy and presents. This picture was taken in a museum/old church called "Our Lord of the Attic"--a small Catholic church that was secretly built and used for several centuries in a house. Our Lord of the Attic Church Children receive candy and goodies in their shoes or cinder (ashes) if they are naughty. Zaarte Piete, St. Nicholas' companion, wears a lace collar, red hat, and happily prances around. He has streaks of charcoal on his face from climbing down chimneys. Another dressed up Zwarte Piet, standing on a high ledge in Dam Square in Amsterdam. St. Nicholas is the patron saint of Amsterdam so his image can be seen on buildings everywhere. This relief is on an old house, near the square--now next to a H and M store. Many people, dressed up like Zwarte Piet, hang from buildings, and prance around singing, dancing, and throwing candy. An owner of a shop in Haarlem, Netherlands who said this would be his busiest part of the year--the next three weeks of St. Nicholas' stay. He provides make up and costumes. The window of his shop, and the outcome of many who will come to get ready to be St. Nicholas.